Donuts, freak shakes and sandwiches, he casts his magic on everything! There is no limitation to your creativity, especially when it comes to making your food look aesthetically attractive. 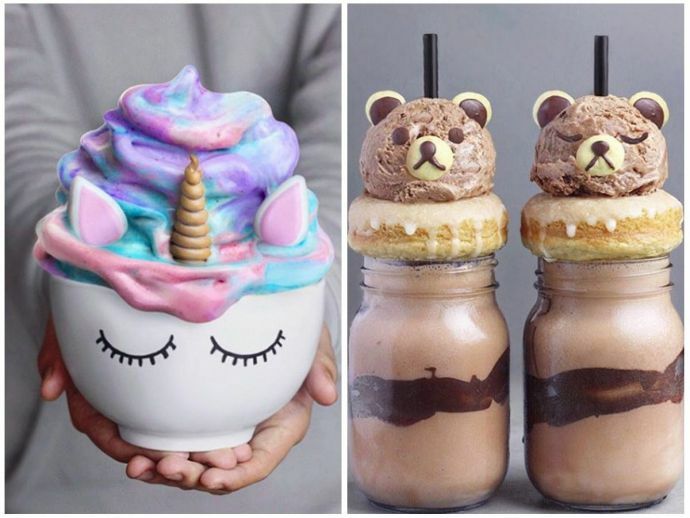 But this 16-year-old boy took all his creativity to another level by making incredible animal-themed smoothies. Well, his creativity is not just limited to smoothies. A bowl of fruit snacks and ice popsicles also help him to add more elements of design. 1. Mermaid: Unicorn- Which of these is your favourite? 6. When you’re missing Christmas! Which slice would you pick? ???????????? Vegan cheesecakes: choco-mint, blackberry, blueberry, strawberry, passion fruit, chocolate & cherry ???????? All of these were so yum! ✨ Recipe, Crust: 1 cup almonds 1/2 cup oats 1 tbsp cacao powder 1 cup pitted dates 1 to 3 tbsp maple syrup or agave nectar Add almonds and oats to a food processor, process for a minute. Add the rest of the ingredients and process again until a dough forms. Spread dough on a lined cake pan (use water so it doesn’t stick to your fingers) Filling: 2 cups cashews 1 1/2 cups non dairy milk 1/4 cup maple syrup or agave nectar 1/2 cup coconut oil, melted + flavor (fruit, chocolate, mint) Blend everything until smooth and creamy. Pour on top of the cake pan with the crust, leave it in the freezer overnight. Add about a handful of fresh fruit to make the strawberry, blackberry, blueberry, passion fruit or cherry slices. Add 1 tbsp cacao powder for the chocolate slice Add a drop of mint extract and matcha + melted chocolate for the choco-mint slice. Definitely one of my faves, hope you like it! ✌???? 4. What is your mood type? 5. Pitch black or colourful rainbow, what’s your choice? 7. Don’t play with it, just gulp it!